Marvelous Multiagers! 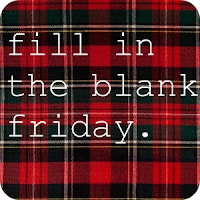 : Fill in the Blank Friday! Anyway, it has been a couple of days and I might have left my camera at school! So here is a fun little post for tonight! My most favorite "little thing" is hanging out with a mug of hot chocolate in the winter. So comfy, warm, and relaxing. I can't believe that we still have 2.5 more days of school next week!!!! The kids need time off of school more than I do. The normal "fun things" that I throw in throughout the day aren't enough to keep them contained... yikes!! The last thing I want to do today is go to sleep... if this fill-in-the-blank is speaking chronologically! If I were writing my own blank today, it would say "the classroom management tool I use around Christmastime that works MIRACLES is _______" because I could really use that information! My favorite candle scent is Sun and Sand by Yankee Candle!! Although I also like any kind of apple..... apple cider, regular old apples. I am pretty easy to please with candles as long as it's not vanilla scented or any kind of baked good scent, like cake or cookies or frosting! Yuck.